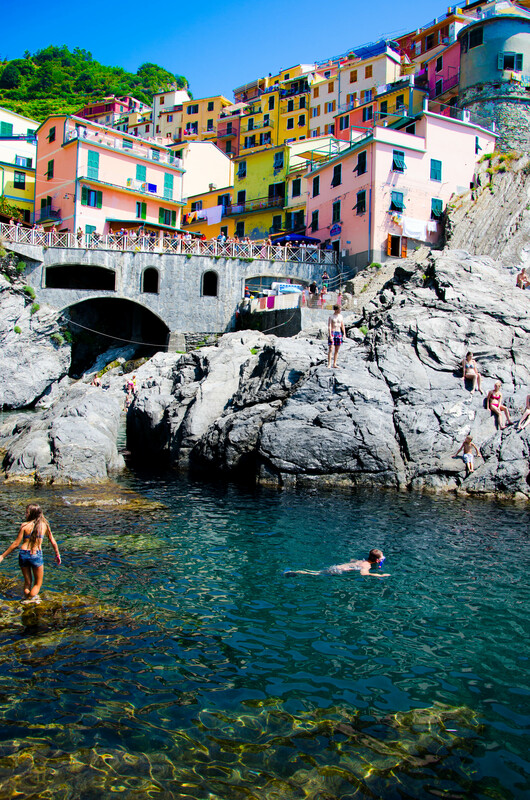 Cinque Terre is not for the weak! Consisting of five very small villages, visitors are able to walk from one to the other to experience the colours, swim in the bright blue ocean and buy a lot of lemon scented products! I was thrilled to be here. I had heard so many praises from friends and other travelers that there was no way I could miss it! Of course, the time that I decided to go was the exact period that they were doing major construction on four of the five paths so the main trails were closed. You were still able to see the villages and there were ways to travel to each of them but they weren’t for everybody. They were a little more strenuous, a little more adventurous and definitely off the beat and track. Exactly what I was looking for. 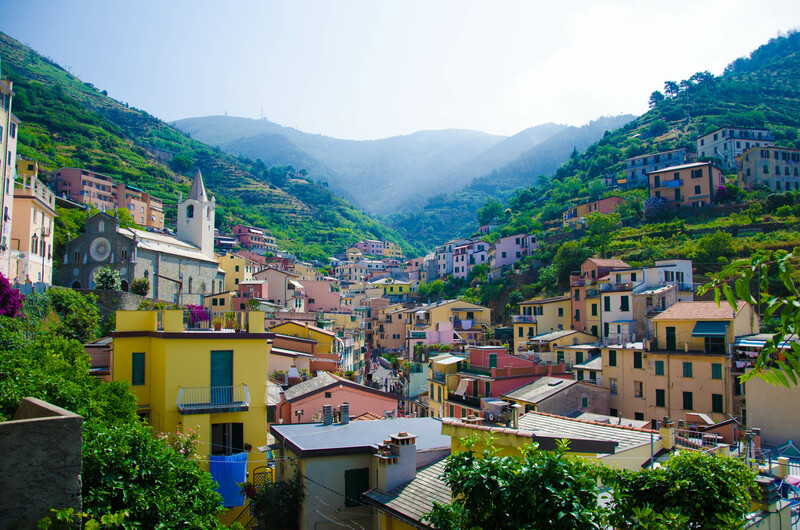 The names of the five towns are Riomaggiore, Manarola, Corniglia, Vernazza and Monterosso al Mare. 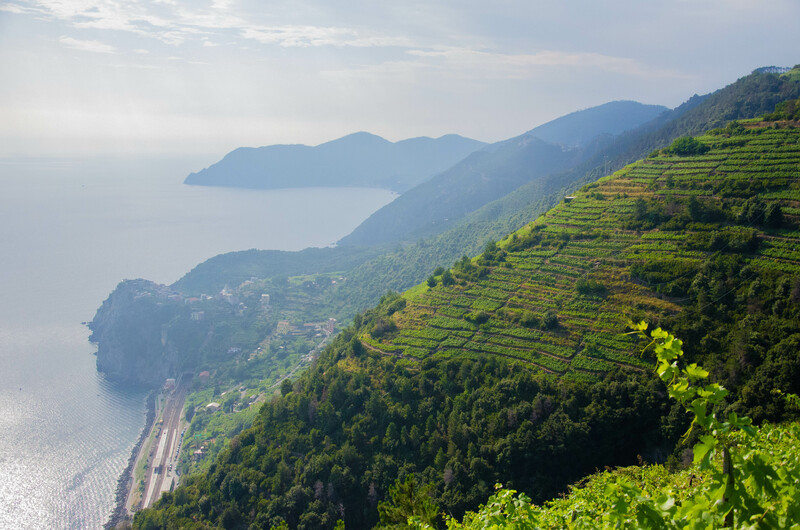 If you look on a map, they travel upward from Riomaggiore to Monterosso and you can start walking from either one. 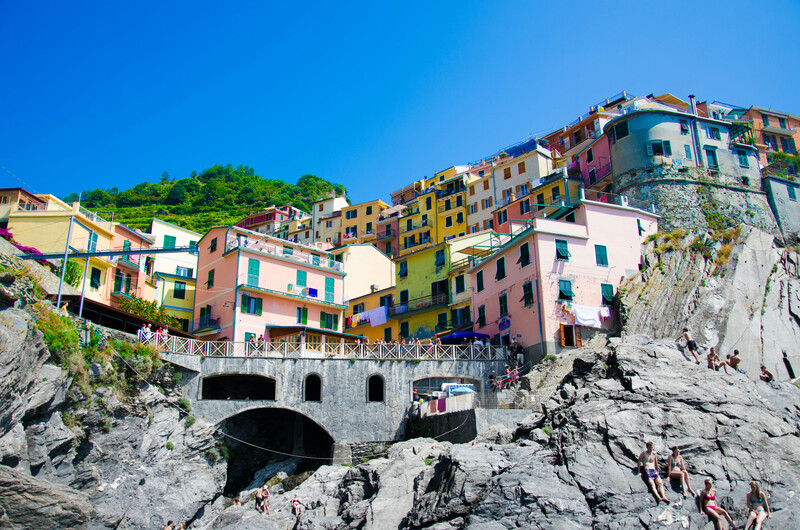 I started in Riomaggiore which exploded with colour. It doesn’t take long to walk through the towns but if you want to get a view of the whole village, everything is up hill. Just to give you an idea about how these places are built, this is Riomaggiore from what I thought was the best view! The gorgeous view never stopped blowing me away. You were constantly surrounded by amazing cliffs and the bluest water I had ever seen stretching for miles. I had the best salad of my life right over the water at this beautiful restaurant called Bar with a View that I recommend to anyone who decides to visit! Seeing as the trail to the next village was closed, I needed to find another way there. Where there’s a will, there’s a way, right? So I took a kayak! Why not! What a way to feel small…I can’t explain how grand the scenery was compared to me in my little yellow piece of plastic. It was an experience I’m so glad I had and oh so peaceful. 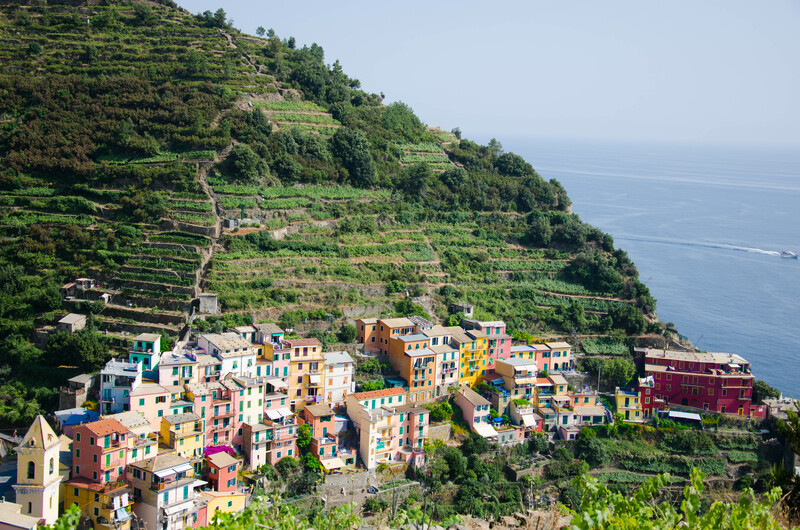 When I got to Manarola, I knew already that it was my favourite of the five. It had something special about it and I can’t exactly place what it was. There was a beautiful cove where tons of people were swimming and jumping off cliffs. Independent shops lined the streets and despite the large amount of people, it didn’t seem as tourist filled as the rest of them did. This one provided the best distant view and I spent a lot of time just basking on the rocks by the water taking it all in. I was told that from Manarola I was able to take an alternate route through the hills to Corniglia and it would take me about 3 hours. As I took my first step, I wondered how long it would really take me..maybe they decided to base it off a slow walker? I traveled until I saw a hand painted sign along the fence saying that turning left would provide a panoramic view (not shown on the map) and right would take you through the valley. Always choose the path less traveled! I went left in hopes that someone wasn’t messing with me. 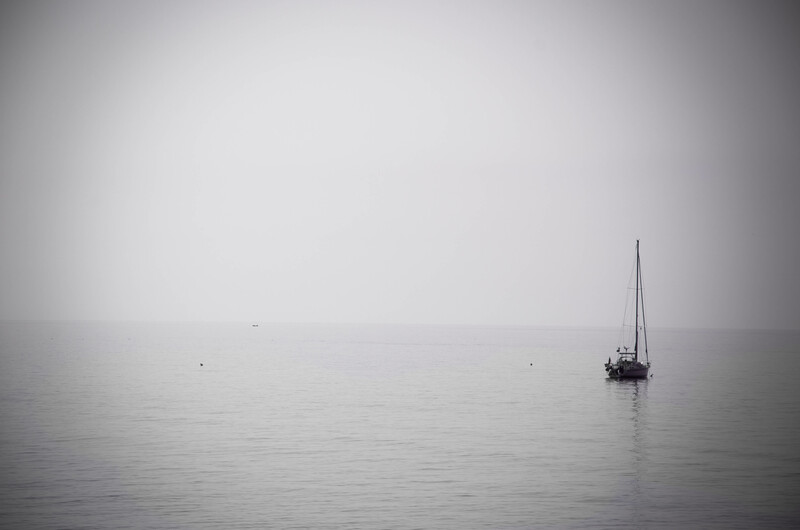 While she seemed to be taking every stride with confidence, I was dwindling. She acted as amazing motivation and kept remarking on how glad she was to be doing this. I felt the same way. Through the heaving and sweating, the view took away any feelings of regret that may have been lingering. I debated going any further. 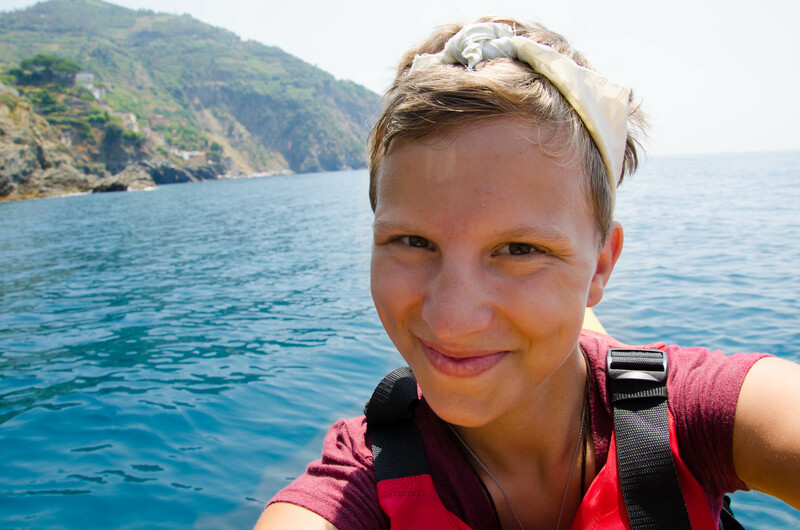 She was only planning on heading to the town in between Manarola and Cornigila while I was initially planning to head all the way to the end. As we were half way up the steps, I had decided to stop in the same town as her and bus home. I was exhausted and afraid of passing out on the second half but she really encouraged me to keep going. 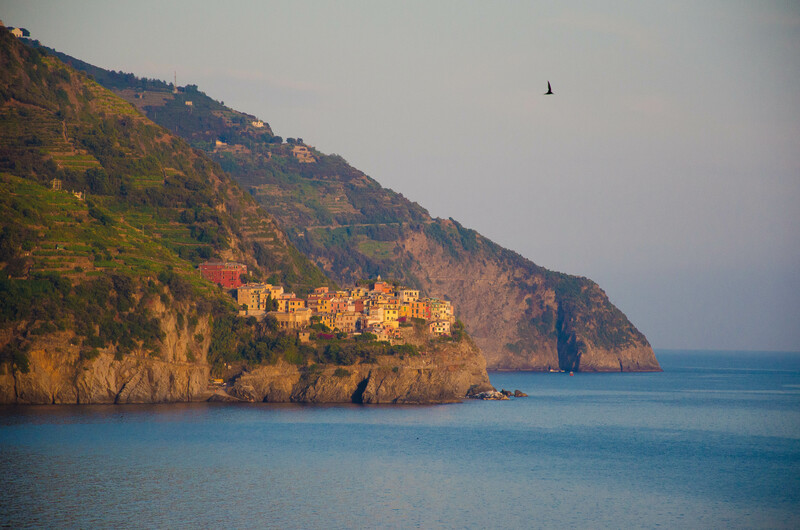 “I really think you can keep going to Corniglia”, she told me. When we finally reached the top, her family was waiting. I was able to meet them, got her email, we said our goodbyes and they headed off to reach their next destination. I decided to sit and write while I decided what I was going to do next. I debated heading in the direction of a few people who had taken the next trail. Maybe more company would keep me motivated to continue? I didn’t end up following them and instead I sat on the bench, still catching my breath. I believe there was a reason that I didn’t take the trail at that moment. Just as I decided I was finally going to get up and walk the rest of the way, for her, they came walking back. “I think I’m going to do it!” I told her. “Us too”, she said and smiled. So, we walked. It was an estimated hour and a half more and it was all down hill so it wasn’t as hard on the legs. The view also managed to become even more beautiful as time went on and we were literally scaling the hills on very narrow paths. It was a very long way down. I ended up bonding with her 17 year old daughter quite a bit. She is so down to earth and one of those gentle souls that you feel safe around immediately. Her name is so unique and when I email her Mom I’ll get the correct spelling but her Father told me that it translated into “Strong Warrior” which fit her perfectly. She told me about the places she had lived and her life in Iceland. Forests are not common where she’s from. She said that a common joke (which I thought was super funny) was “What do you do if you get lost in a forest in Iceland? You stand up.” I laughed. So what we were walking through wasn’t something she was used to at all. I also developed a greater understanding for the phrase, “It’s all downhill from here.” Walking downhill was almost harder than walking up. It’s very easy to lose your balance and you feel like you’re being pushed most of the time. It was so much easier talking to my new friend along the way. Her whole family was so great to be around and I never would have gotten that far had I not met them. 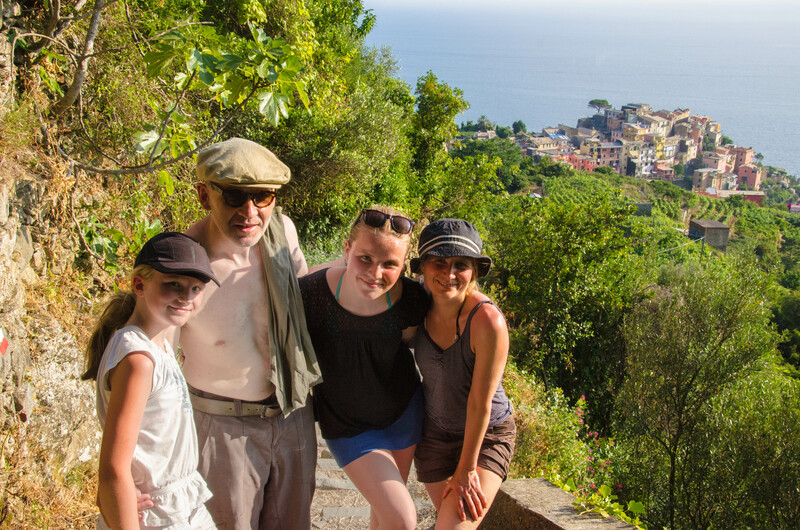 When we reached Corniglia, I received a kiss on both cheeks from Irma and her daughter goodbye. They told me to let them know if I would ever be in Iceland (I plan on it). I called it a day at that point since the sun was setting and planned to do the next two villages tomorrow. 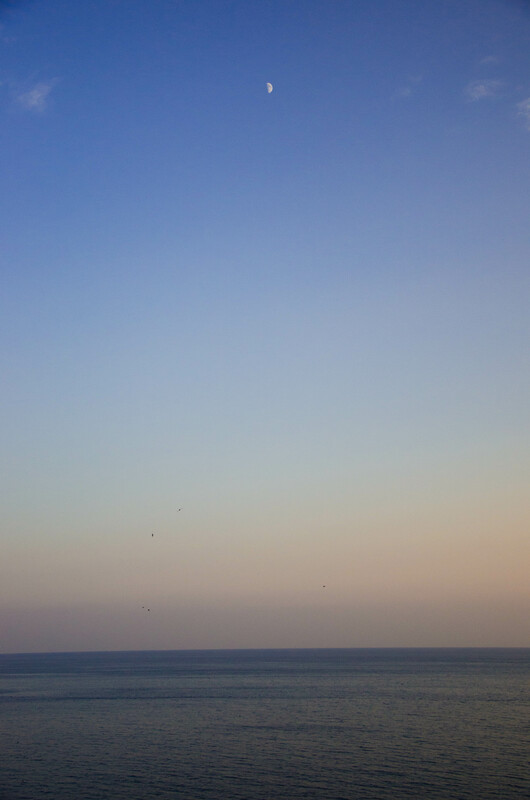 Hope you enjoyed a sensational day and that you were able to take all the pictures you needed. Here are some refreshments (to consume as quickly as possible). Was a pleasure meeting you, enjoy the rest of your trip! I almost cried because it was so thoughtful. I wish I had gotten the chance to know them a little more but I was leaving the next morning. 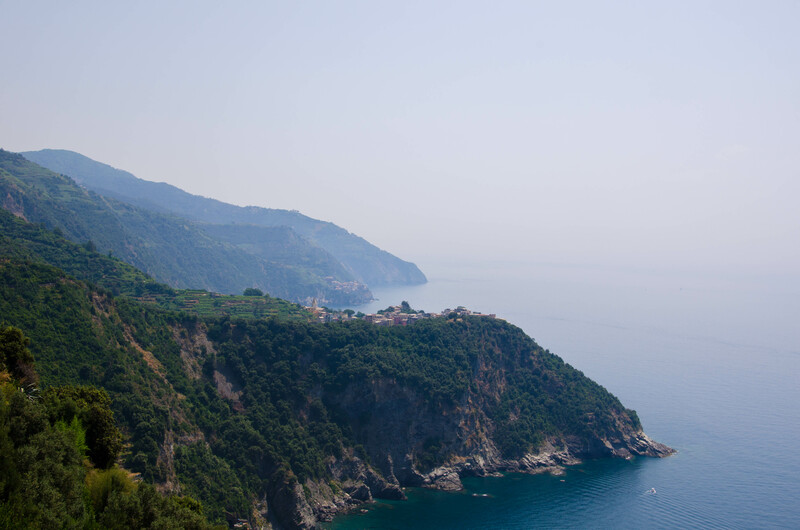 The next day, I walked from Corniglia to Varnazza and then took a train to Monterosso (which was the least interesting village in my opinion). Corniglia had this gorgeous little market with the freshest fruit and sandwiches and it was so inexpensive (a rarity these days). 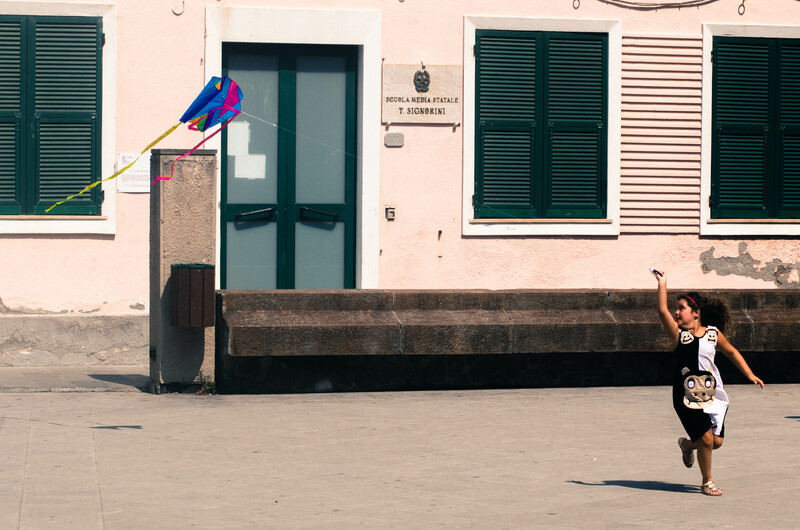 I loved it almost as much as Manarola just for that! The main path was open so I took the hour and a half walk and then took the train back to head to Rome that evening! It’s crazy how much I can get done in a day and even more amazing how many people I meet in a day as well. I met this great couple on my way to Rome. Their names are Linda and Anders and they invited me to sit with them for the 3 hour ride there. They are such amazing people. 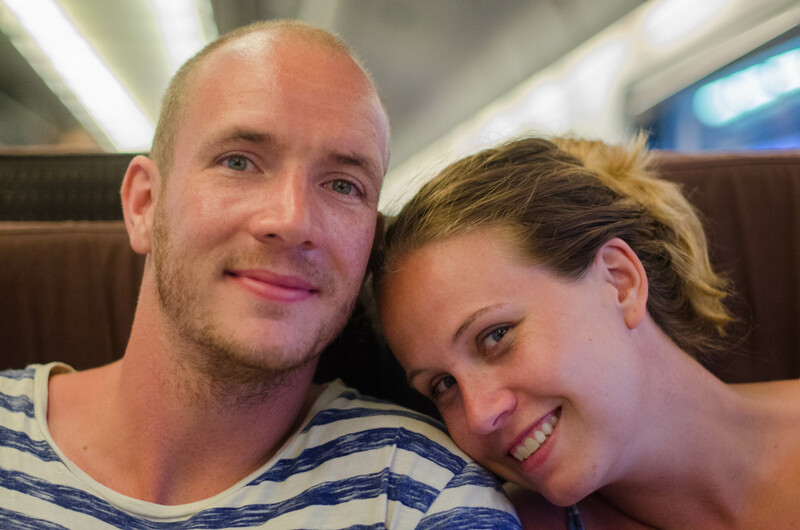 He is from Denmark while she is from Norway. Both of them are Physical Therapists and met in University. Anders said that he deals with patients at the hospital who are then sent to Linda next. They essentially work together and help a lot of the same people. The job seems incredibly rewarding. Anders told me that a simple “I appreciate what you do” makes his entire day worth it. Even a small success of helping an elderly man stand for 3 seconds is a moment that is cherished by them both. They are both 25 and so easy to talk to. It was a blast spending time with them on the train. I arrived in Roma last night and can’t wait to share my experiences already! Keep in touch and so much love! It was really nice spending some time with you! We’re back in Norway now, getting a grip on laundry before heading to Arendal, Norway tomorrow! We’ll also be going to Denmark next week! Have fun in the rest of the world, and remember, “some people are so poor that all they have is money!” Treassure this journey! It is so nice to hear from you guys again! I absolutely loved meeting you both! You both have an amazing time on your travels too and I really wish I had found a place to include that quotation in this post! Love it!